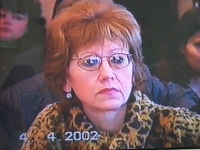 Tatjana Rumjantseva, Doctor of Philosophy – Professor Belarussian State University. What we see over here is something getting out of the limits, getting out of the rules. I would like to draw your attention to the fact that what we see over here, the author calls them Angel drawings, is something getting out of the limits, getting out of the rules. The rules of the typical variance, the ways of painting and the techniques. The example that is getting to my mind is of the post impressionists as they also did it. They also broke the rules. I wanted to say that for me the technique, the way of painting is not really an argument and we should thank god that through all the art history came the point, came the period when all the rules, all the traditions were broken and we started from somewhere new. I’m thinking about the time when we were living amongst the rocks and paintings on those rocks. You mentioned ironically that it’s his personal expression, but when you think of it, art itself is always an expression of the personality. So it’s not a science, that makes it different from science. So in this case we see something different coming from the inside because art is always self expression, it is always different. 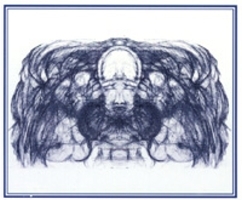 In this case there’s a charm in it because his Angel drawings are innovative, original and different from others. And this is important, this is a type of fantasy art we can look at, we can experience together with the author. There is another aspect I wanted to attract your attention to: I was thinking from the point of view of the philosopher, who I really am. As you know philosophy is a kind of science, it’s not really science but it’s a philosophical way of understanding reality. From the times that science became mature - if you think about the 17th, 18th century - I’m still absolutely convinced in the idea, mankind is still living under the pressure of the idea that we should understand the world mentally. And we still see as a dominating idea that rational, scientific attitude, scientific approach is nearly the only way of approach to explore the world, to analyse it and to get understanding of what it is. 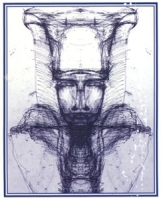 And when I see the angel drawings that are around me, I get an idea that starts being dominating in me that the other philosophical ideas like an intuitive approach also have rights to exist and to be popularised. I think that all these approaches have a right to live. I would like to see us getting out of this room being enriched, enriched with all that we’ve seen here. Maybe it can be a starting point for us to look inside ourselves. Maybe there is something inside us we cannot rationalize, we cannot get from the results of a bloodtest. And even journalistics taught this man to some extent because he’s found his way of selfexpression, his own 'angel therapy' if you want, his own way of coping with his own internal problems, and I think that this is worth our attention and this has right to exist. It is interesting and it is worth doing research on, it’s worth looking at closer in on its origin, to try to understand it’s source, the ends of it. I am glad that this kind of research started and that there are enthousiastic people going for it and at least as for me, I will take a lot of important things for myself with me leaving this room.